Yep! You guessed it. This guitar is yet another example from that well-known purveyor of crap guitars, Antoniotsai. Do you remember the Biscuit Tin Les Paul? Well, now I've found a Biscuit Tin Telecaster, made by Tanglewood and described erroneously by the seller as being paisley patterned. Regular readers will know that I am a big fan of Ovation's solid body electric guitars from the 1970s, especially the Breadwinner and Deacon models. I did a double-take when I first saw this rather unusual-looking Ovation Deacon on eBay; I've not seen one quite like it before. 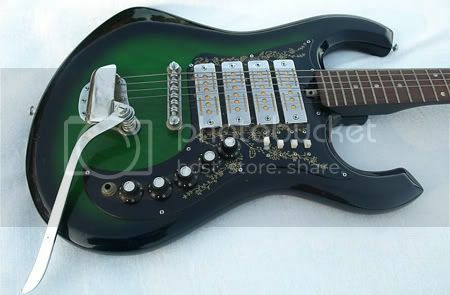 I suspect that the neck and neck plate on the back of the body are the only actual Ovation parts. The neck with its white binding and double diamond inlays would appear to be accurate, but the body is wrong for a genuine Deacon as it has obviously not been routed for pickups and electronics mounted on a scratchplate. The pickups are not Ovations, the bridge is a Gibson style Tunomatic and the control layout is not correct. It doesn't appear to have the active electronics that a genuine Deacon or Breadwinner would have. Whoever put this guitar together has done an excellent job as the body shape and the forearm and belly contouring look to be absolutely spot-on, whilst the colouring of the wood matches the neck very nicely. The effect is that it looks like it should be original, but there are too many un-Ovation things going on here for this to be the case. I've just bought this carcass (i.e. 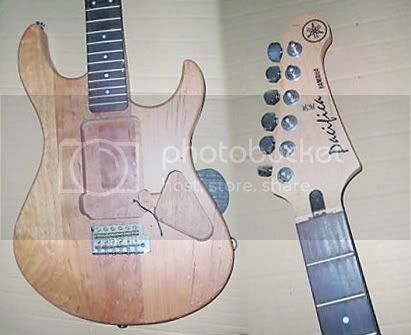 body and neck) of another Yamaha Pacifica 112. I've not decided if I want to re-finish it yet. The body does have a fair amount of knocks and dings in it but I'm not convinced that they are a problem seeing as relic guitars are supposed to be so cool. However, if I do re-finish it, it won't end up looking like a deck chair this time! For this project I want to equip the guitar with a pair of Danelectro lipstick pickups that I've had lying about in my box of bits for ages. Now, I'm not quite sure how these should be installed as yet, because if you look at a Danelectro guitar you'll see that the pickups are attached via long screws from the back of the guitar. This shouldn't be too much of a problem for the neck position of the Pacifica - all I'd need to do is drill screw holes in the required positions - but the bridge pickup location puts it over the tremolo spring cavity. I'm not quite sure how I'm going to approach this yet, but I'm thinking on it. If anyone has any bright ideas, let me know! I don't know how I managed to miss Blackspot Guitars at the London Guitar Show earlier this year because they are certainly distinctive looking! Blackspot guitars are built by Patrick in Bristol in the UK. I really like that he has developed his own unique designs and they are not yet another variation of the same old thing that most big guitar companies are churning out. They may be a weird shape but apparently they are supremely comfortable to play. Blackspot guitars are now also producing a range of acoustic guitars which while they are much more traditional in design than their electric counterparts, also have one or two distinctive features such as the shape of the scracthplates, headstocks and the fretboard inlays. You just don't see guitars with 4 pickups these days, do you? Not comtemporary instruments, that is. Those 4 pickups on this tasty greenburst Kimberly have a Teisco look to them. As another Japanese guitar this Kimberley could well have been made at the same factory that produced Teisco guitars. It's not just the pickups which are in abundance. Just look at all those knobs and switches! On the subject of guitars with a crazy number of pickups does anyone remember a photo in an early edition of the UK's Guitarist magazine which showed a reader's Stratocaster which he had fitted with nine single coil pickups and a whole bunch of switches? I'd love to see that picture again. Sony have really been pushing the boat out for this one with listening parties, interactive "Black Ice" trucks visiting cities across America, Angus look-a-like competitions, not to mention actually getting the songs out there onto the major radio stations. Before I'd received this CD I'd already heard quite a lot of this album on BBC Radio 2 when "Rock 'n' Roll Train" was Single Of The Week and a few weeks later when the whole album was Album Of The Week. And why not? 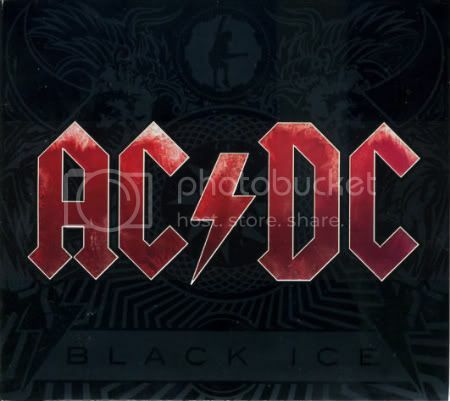 After all it is AC/DC's first album since 2000's "Stiff Upper Lip". In a crazy world full of manufactured pop stars, plastic celebrities and endless TV talent shows and their vile supposedly musical offspring, a new album by a much-loved no-nonsense rock band is surely something to celebrate. But do you really need me to review this for you? You know what it is. You know what it's going to sound like. It sounds like AC/DC. You know exactly what you're getting when you see those four capital letters on the front cover. And that's not to say that it's a bad thing. This is what people want from AC/DC. How alarming would it have been if they'd decided to change their style and produce an experimental electro jazz fusion concept album? Or something? AC/DC's motto must be "if it ain't broke, don't fix it" and this album delivers 15 cuts of no-nonsense straight-ahead riff-tastic rock 'n' roll boogie. On one track I thought I could hear a similarity with early Status Quo, whilst another was reminiscent of ZZ Top. But of course, it's just AC/DC doing their thing. You've got to hand it to the brothers Malcolm and Angus Young who penned the 15 songs here. Along with Black Sabbath's Tony Iommi they surely must be Undisputed Masters Of The Guitar Riff. How they keep coming up with riff after riff after riff (which of course leads to song after song after song) I really don't know. So, to sum up: no surprises but thorougly enjoyable. AC/DC. Does exactly what it says on the tin. 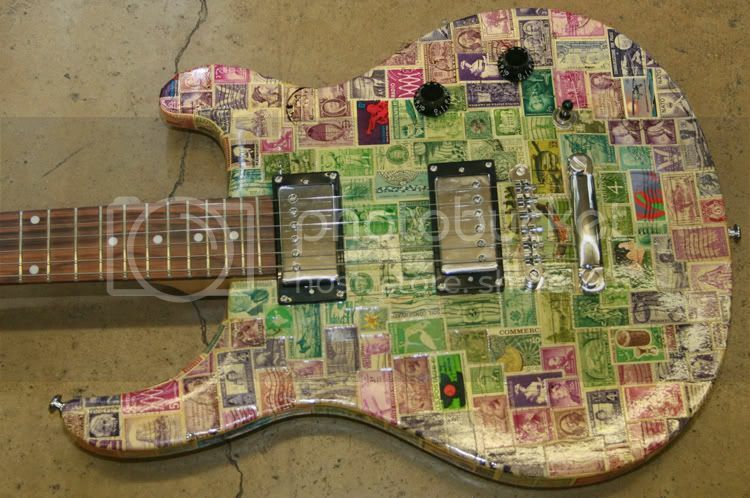 Torn between your guitar and your stamp collection? Don't have enough time to persue both pastimes? Well, now you can combine your hobbies with the Les Stamp guitar! 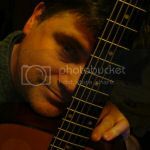 I've just added another guitar blog to my blogroll. Smojo Cigar Box Guitars is a fascinating look into the world of cigar box guitars (or CBGs). The blog's author, David, got the CBG bug a couple of years ago when he tried one for the first time. He was then intrigued enough to turn his hand to building his own. 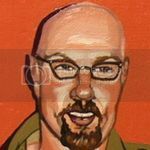 His blog documents the CBGs and cigar box amps that he has built and also covers related matters such as playing techniques. I've not tried a CBG myself but have always found them most appealing. One of these days I'm going to have to dip a toe into the CBG ocean. 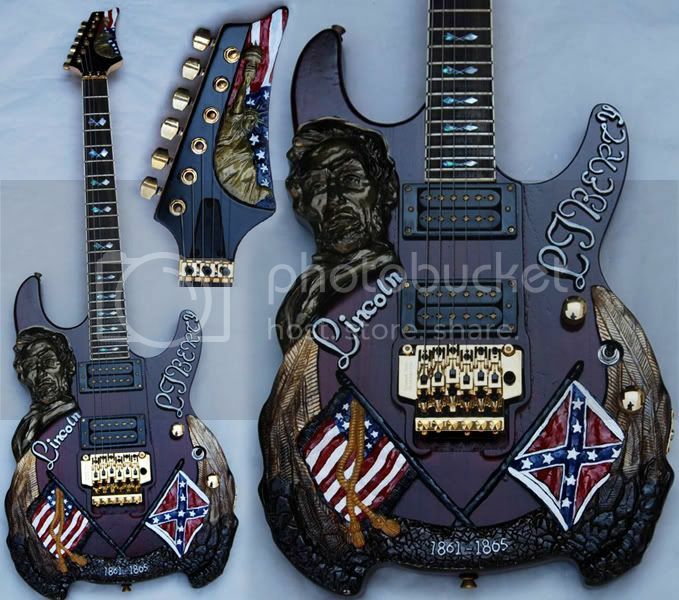 I admire the whole concept - they are basic raw instruments and are the ultimate recycled guitar. Also, check out David's CBG videos on YouTube to hear how they sound. 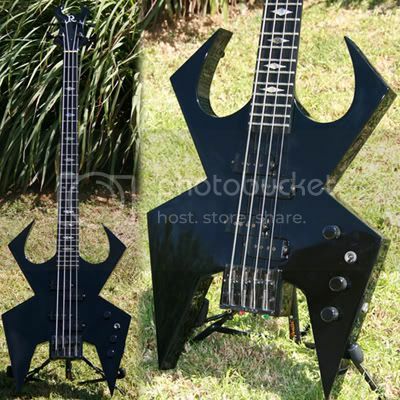 Yesterday, I showed you a bass design that really did not appeal to me, so today I'm showing you what I consider to be a far more attractive design. This 3-string bass was a custom order for AV Basses, a Czech company who specialise in boutique basses with as many strings as you want - 4, 5, 6, 7 or even 3 as on this example. I love the original shape of this bass, and the scroll on the upper horn is a nice touch. Chicago, IL (October 21, 2008). 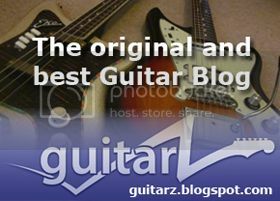 The social network for guitarists MyGuitarSpace.com has announced the last call for entries in the MyGuitarSpace.com Best Instrumental Contest. Entries will be accepted through the last day of October, and the winner will receive a check for $250. Guitarists interested in entering the contest should sign up on MyGuitarSpace.com for free and enter a video clip of themselves playing any song of their choice. Voting for the contest is done by fellow members of the MyGuitarSpace.com network. 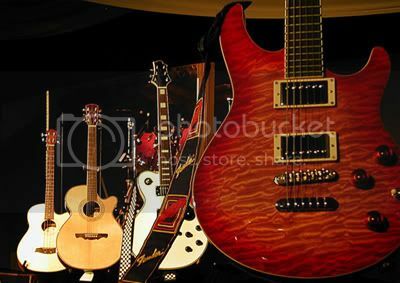 The MyGuitarSpace.com network, which is completely online, free to join and for guitarists of all levels, launched in July of 2008 and continues to attract hundreds of guitar players and guitar lovers daily. MyGuitarSpace was launched on the web as a way for guitarists to share and receive tips, stories, videos, opinions, and more from other guitarists across the nation. In addition to the vast social networking available, MyGuitarSpace hosts instructional and entertaining videos, shares relevant guitar humor and stories, and holds contests and giveaways of guitars from participating partners. 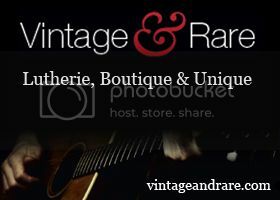 The website has received great responses for its ease of use and ability to instantly connect guitarists with similar interests and tastes. MyGuitarSpace is free. To find out more or to join, visit myguitarspace.com. I might well be risking a ton of hate mail when I say that I've never liked BC Rich guitars, but this BC Rich Widow bass really takes the biscuit! It's a particularly horrific design even by their standards. It has a real homemade, designed by someone who has no idea look to it. Those straight edges make it look like some kid has been sawing chunks out of a piece of wood. This album was released a week ago and I've had it on heavy rotation since then. 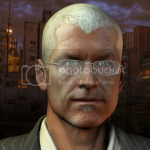 John Illsely is a name that a few of you might recognise; he was bassist for Dire Straits. Irish singer songwriter Greg Pearle, on the other hand, is not so well known. Illsley allegedly heard him performing at a pub gig in Lincolnshire and was captivated by his unique voice. The press release that came with this CD likens Pearle's voice to Tom Waits, Van Morrison and Chris Rea, and I can certainly agree with the latter. 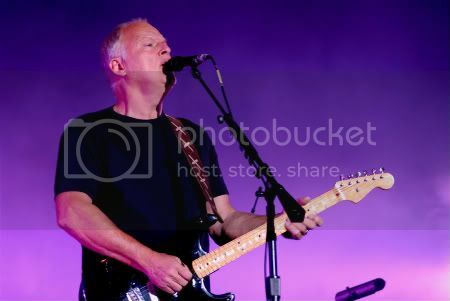 However, I know I shouldn't really make such obvious comparisons, call it sloppy reviewing if you will, I can't help feeling that Pearle's gravelly voice occasionally reminds me of Mark Knopfler, although I think he's actually a much better singer. You can imagine that he'd do justice to any Dire Straits songs these two choose to perform live. In other places such as on "Got No Plans" you could almost mistake him for a younger Neil Diamond. 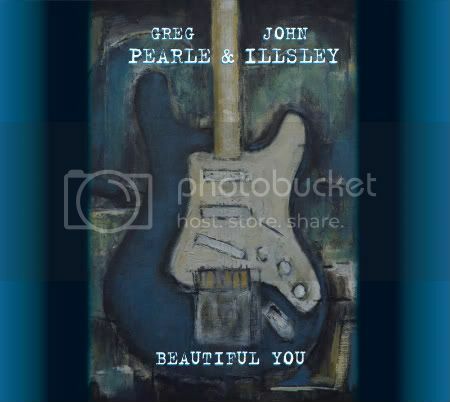 Both Pearle and Illsley play acoustic guitars throughout the album, whilst Illsely also provides lead and bass guitars. 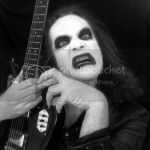 I'd always thought of him as a bassist and was thus a little surprised at the quality of his tasteful lead guitar playing. He's a nice understated player - nothing too flash - just adding what is required by the song. Sorry - but making the obvious comparisons again - sometimes I think I can detect a certain Dire Straits-ish quality to the guitar. Perhaps the fact that the album was recorded in Mark Knopfler's studio meant that Illsley was able to use Knopfler's set-up or perhaps I'm just imagining this. Guy Fletcher from Dire Straits is also on board providing keyboards, string arrangements and some lap steel guitar on "Precious". His keyboards on "Love Let Me Breathe" remind me of Steve Winwood and his Hammond organ, which is no bad thing. The opening cut "Secret Garden" is one of my favourites - acoustic guitar driven and embellished by a gorgeous sounding horn section. My only problem with this song is that is fades out far too quickly. Of the other tracks, "One" starts off with some folksy Irish whistle playing but turns into a rock ballad with that (possible) Straits-esque lead guitar sound and "Loving You" has yet more of that gorgeous Stratocaster tone. "Got No Plans" features cittern playing by John McClusker. It's quite an exotic sound, almost middle-eastern in feel and takes the song in an unexpected but welcome direction. "Demons" reminds me of Phil Lynott's "Diary of a Blues Singer" - it must contain a similar chord progression. Complete with a smoky sax solo this a song that you could imagine listening to late at night at a sophisticated club. It oozes class. Actually the whole album has that late night laid-back mood. I didn't originally think it would be my kind of thing, but I was very pleasantly surprised at the quality of the songs, the production, and at how much I ended up enjoying it. Why not hear for yourself? The tracks "Secret Garden" and "One" are available as free download from www.johnillsley.com. 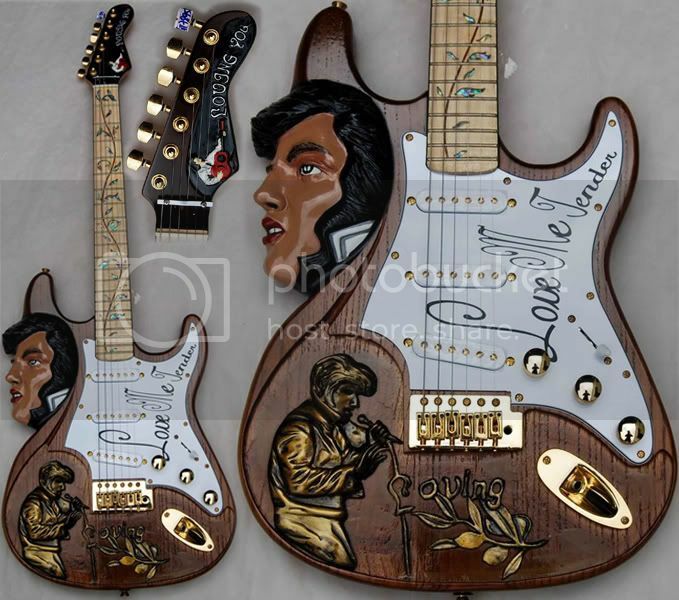 We've seen an Elvis guitar from Antoniaotsai before (not to mention his dreadful Jimi Hendrix guitar) but this time Elvis in full colour! Scary, huh? I can appreciate the link between Elvis and the guitar. However, what the guitar connection is with Abraham Lincoln I have no idea! I didn't think he played guitar? Here's yet another cowboy guitar! 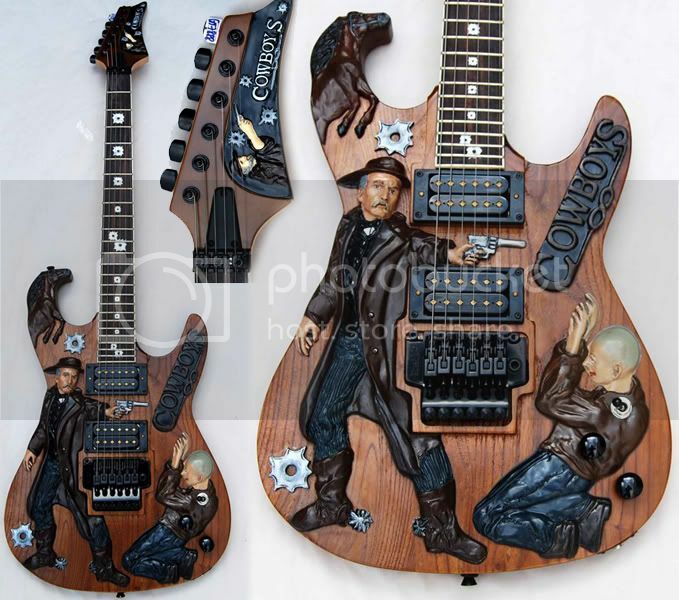 Coming from Antoniotsai's Guitar&Mandolin Arts - our favourite bonkers Taiwanese retailer on eBay - this Cowboys Guitar is so awful that it's actually a work of genius! Note: Unfortunately, it has come to my attention that Antoniotsai's guitars are rife with problems: wood cracking and splitting, necks warping, etc. If you are considering buying one of these guitars, I'd suggest reading this page first. Here are a couple of finds for collectors. 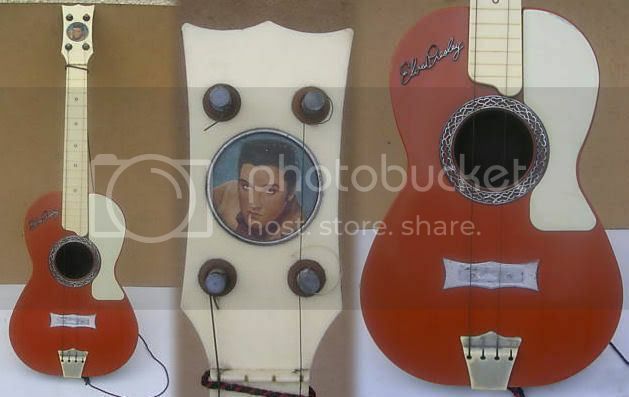 The first is an Elvis Presley plastic toy guitar, made in England by Selcol. I'm guessing its from the 1950s or early 1960s. It's a 4-stringer so some might want to classify it as a ukulele but I doubt very much that it's a player anyway. Despite missing a couple of parts its in very good condition and would no doubt appeal to the collector of Elvis memorabilia. Our second dates back to the 1950s, the era of cowboy movies, and is an American Western plastic toy guitar. This looks to be in immaculate condition, and unlike the Elvis guitar, it is a 6-stringer and has all its string intact. However, I doubt it plays any better. I love the various western motifs embossed into the top of the guitar. 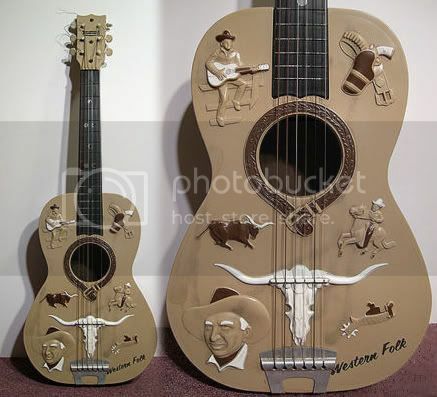 In particular, the guitar playing cowboy on the upper left could have been the inspiration for the decoration we saw on the Brandoni Telecaster recently. 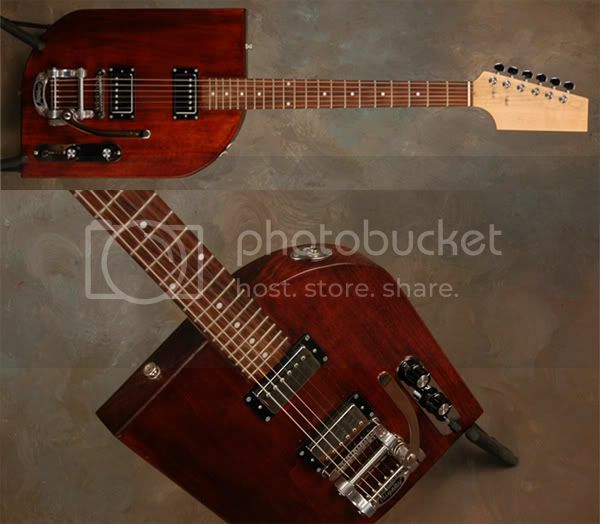 The seller of this oddly-shaped guitar likens it to Bo Diddley's rectangular guitar, but you will notice that two of the corners have been rounded off in this instance. But for me, the real oddity about this guitar is the location of the output jack near the neck on the lower bout. Why would anyone want to plug in there? Telecaster and Les Paul all on one guitar! So imagine the situation. You're up there on stage playing your Telecaster and you're about to take a solo when you think to yourself, "I wish I could switch to a Les Paul for this solo." The above situation isn't that likely though and $1,499.00 is a lot to pay to deal with such situations. I would imagine a guitar with a pair of six-string necks could be useful for using different tunings, although how often would you need to change mid-song? Let's face it, it's a doubleneck and it's mainly a visual thing. Crikey! 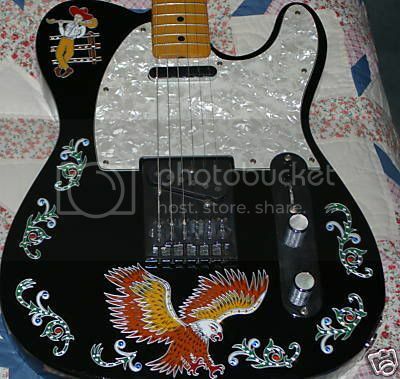 This customised Tele-style guitar from Brandoni Guitars is a bit - how shall we say? - tacky, isn't it? 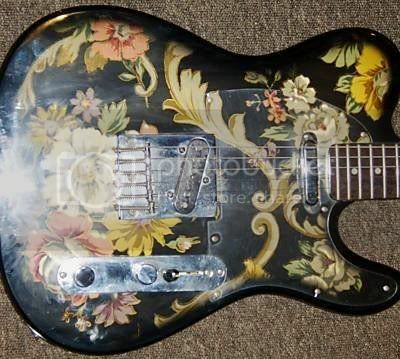 I'm guessing the graphics are designed to appeal to the country player, but it's too chintzy for my tastes and I'm a guy who likes Fender's pink paisley and blue floral finishes! 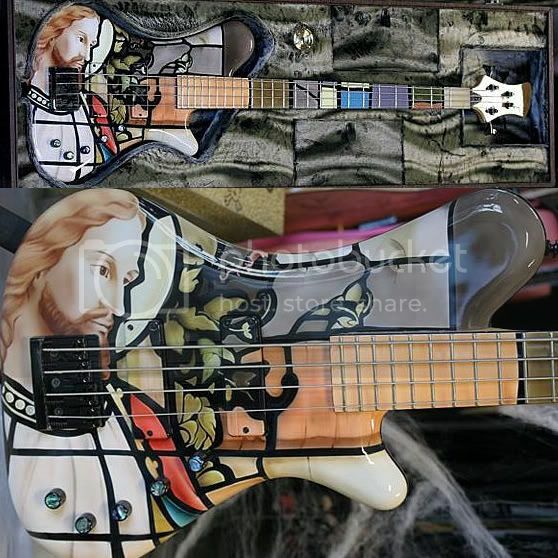 This hand-crafted hand-painted Dot on Shaft Lord Basso bass guitar with its stained-glass window graphics is one of those love it or loathe finishes. Speaking for myself I'm with the "loathe it" brigade. I can't help wondering how distracting that painted fretboard would be. 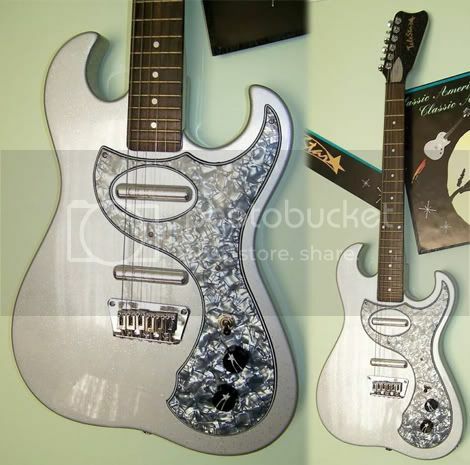 This Silver Sparkle TeleStar Mona is another modern retro-styled guitar based, of course, on the famous Danelectro "amp-in-case" guitar. Judging by the Harmony Central reviews, people are quite impressed with these Korean-built guitars. The modern Danelectro company (related to the original Danelectro in name only) have also re-issued this design - the Dano '63 - but I must say I prefer the look of the TeleStar, especially the headstock shape. The silver sparkle finish on this example looks great in the photos, but I worry it might look rather naff up close in real life. I have a Fernandes Native guitar in a similar finish and it really is quite ghastly. The body is apparently made from something called "tonium", which I'm guessing is a new brand name for some kind of masonite-like material. As a modern interpretation of a classic design it sounds like a good buy for the Dano fan who wants a guitar that intonates and plays nicely whilst retaining that Dano vibe. Does anyone want to tell this eBay seller that it's NOT a 10-string ukulele, it's a charango. OK, who out there wants a FREE GUITAR STRAP?... 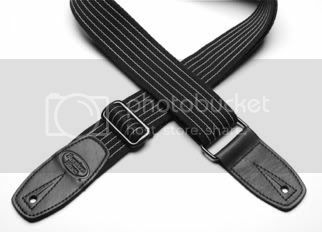 and not just any old strap either! Those nice folks over at Reunion Blues are giving away Merrino Wool guitar straps to the first four Guitarz readers to click through and mention "Guitarz" in the comments on their blog. Sorry, but this offer applies to US residents only. But hurry before they are all gone! 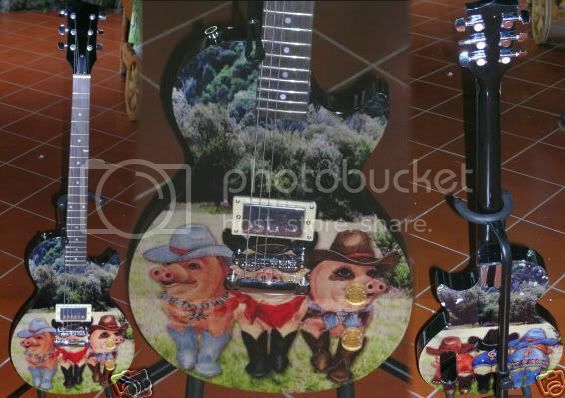 Click here and comment now - don't forget to mention "Guitarz"
Here's another guitar with pigs on it. For some bizarre reason - perhaps there's a metaphor going on here that I'm unaware of - the three pigs are dressed as cowboys (cowpigs? I've heard of a sheep-pig, but not a cow-pig). The pig in the middle seems to be wearing a pair of fancy shades and also seems to be playing the harmonica. See also this similar cat guitar and this other piggy guitar that we found of eBay recently. 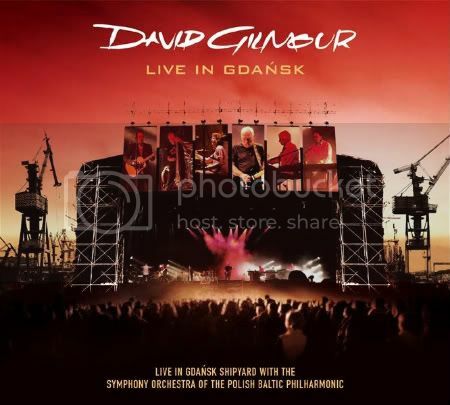 ...or to give it its full title, "Live in Gdansk Shipyard with the Symphony Orchestra of the Polish Baltic Philmarmonic", my review copy is a double CD set, although a quick glance at Amazon shows me that there is also a 3-disc set, a 4-disc set, and a deluxe 5-disc boxset. Sounds like too much choice to me. Aside from the DVD, the extra discs seem to have quite a lot of filler on them - the same songs but from different venues on the same tour. I wonder if anyone is bonkers enough to buy the lot? Anyway, as I said, I have the bog-standard two-disc version with no DVD, so that's what I'm going to be talking about here. Roughly speaking Disc 1 seems to be mainly Gilmour solo material (lots of tracks from "On An Island" which are all nice enough although not earth-shattering) whilst Disc 2 is largely composed of Pink Floyd numbers. This caused me to ponder the fact that with Richard Wright on board on this tour, it's more or less latter-day Pink Floyd in all but name anyway. They just have a different drummer, and of course Roger Waters was long gone in the latter-day Floyd anyway. (On a sad note, this release has become the swansong for Richard Wright who died last month). So, what's it like? Well, if you are a fan of Pink Floyd and/or David Gilmour then you'll probably love it. You might even want to buy the posher editions with the extra bits and pieces. It sounds like a really atmospheric concert. The audience are clearly loving it. The sound is absolutely faultless. The playing is all perfectly executed. So why did I find the whole thing so dull? Somehow it all feels too safe, too respectable. In their day Pink Floyd had a bit of an edge to them, and that seems to be lacking here. There are some intense guitar solos, as you would expect from the Strat-wielding Gilmour, but even these feel sanitised to my mind. I'm not saying that it's a bad set, it's just for me that it lacks excitement. It just isn't stimulating. Perhaps you had to be there. Perhaps I needed the visuals and would have found the DVD edition more to my liking. This is the sort of music that I'd put on as background music if I wanted to chill out. Somehow that seems wrong for someone from Pink Floyd. If you are a fan, ignore me, you'll probably love it. When I first saw the picture of this Astor Studios Hawaiian Guitar my immediate though was, "That's a short neck! Joins the body at what? The tenth fret?" Then I realised that it was a hawaiian guitar and would be played lap-style. Nevertheless it's a peculiar looking instrument. It looks almost as if you could use it as a small boat or coracle. 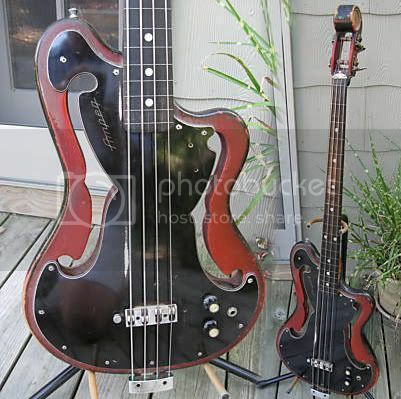 Its shape also reminds me of the now legendary wheelbarrow bass. The seller estimates that it might date back to the 1930s or 1940s. What appears to be a dull grey finish in the photo, is actually a green marble. A friend of mine is a Lou Reed fan. I asked him if he'd like to come over and view this DVD with me, thinking that perhaps he could furnish me with a few tidbits of information which would assist me in writing this review. He wasn't too keen. "You won't like it," he told me. Apparently it wasn't my "kind of thing". He went on to say that it was Reed's most unaccessible album and that he couldn't understand why Lou Reed had resurrected and toured it. So, as you can imagine, I approached this DVD with a certain amount of trepidation. And you know what? I reckon my friend was thinking of the wrong album. Surely he was referring to "Metal Machine Music" which was a double-album of guitar feedback loops (and didn't I hear somewhere that this has now been arranged as an orchestral piece?). Anyway, I really couldn't see what my friend's problem with "Berlin" was. Sure, it's a bleak piece subject-wise, dealing as it does with the inevitable self-destruction of two drug addicts, Jim and Caroline. However, the music is classic Lou Reed and as a performance piece I found it highly engaging. The visuals of the band on stage are punctuated with specially-shot film footage depicting the characters in the story. This works very effectively as it takes it away from being an ordinary concert video. The camera also gives us some very interesting angles. 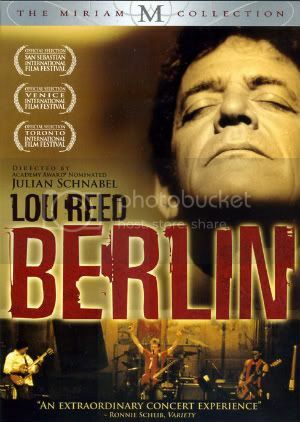 It seems at times like we're up there on stage with Lou Reed and his band, moving between them and behind them. What we don't get are irrelevant shots of the audience enjoying themselves. That may be all well and good on an AC/DC live video, but here it's really not needed and frankly the film is all the better for it. Reed and his band - led by guitarist Steve Hunter (who also played back on the original 1973 album) - are joined on stage by a string section, a brass section and the Brooklyn Youth Chorus, and the sound is magnificient. Reed hardly seems to touch his guitar on the first few songs, but as things progress he plays some incredible solos and duets with Hunter. I'd quite forgotten what a good guitarist he is. I'm not going to do a song by song breakdown. Let's just say that it's a great performance from all concerned. Having the Brooklyn Youth Chorus along for the ride was a stroke of genius, especially in those somewhat disturbing moments in the narrative when the children's distress at losing their mother is conveyed. I'd say this was an essential purchase for all Lou Reed fans and those of the Velvet Underground too (seeing as some Velvets songs had been re-worked as songs in "Berlin"). It also shows quite nicely what a music film can look like given a little imagination. Visually and musically rich, but not one to view if you're feeling depressed. Here's one for regular reader Andy! 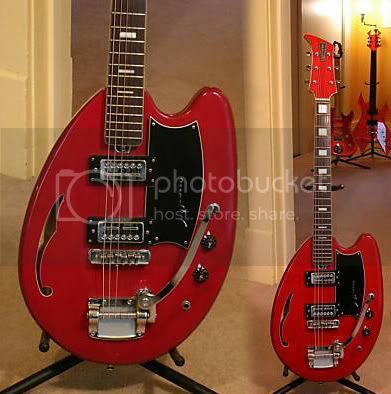 It's a mint condition Teisco May Queen guitar in a rare red finish and bearing the Apollo brand name. 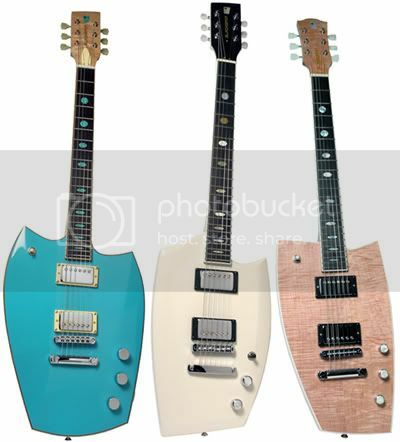 These always reminded me of the Vox Teardrop guitars, albeit with a slightly modified shape. 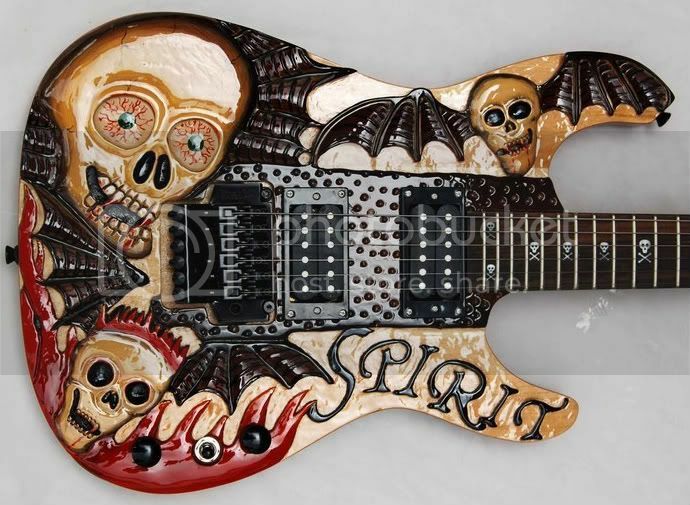 Cool guitar, and the auction finishes very soon! Tomorrow night sees the first of a three-part series, The Story of the Guitar on BBC television (click link for full details). Alan Yentob embarks on a three-part personal journey to discover how the guitar became the world's favourite musical instrument. Beginning with the rise of the acoustic guitar, the series takes him from an ancient Middle Eastern ancestor of the lute, to the iconic guitars draped round the necks of Bill Hailey and Elvis Presley and beyond. Featuring interviews with Bert Weedon - the man who taught Britain to 'Play in a Day', Pete Townshend, Bill Bailey, flamenco player Paco Pena and classical guitarist John Williams. Those of you in the UK, remember to set your video recorders! 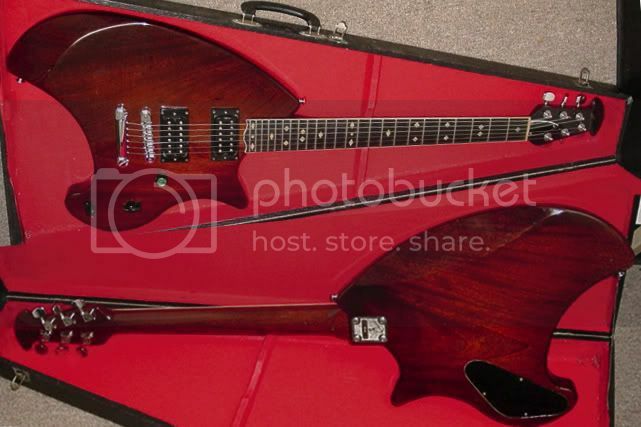 I thought I'd seen some weird guitars on eBay, but this one has got to be one of the strangest. I wonder what made someone decide to turn this length of metal pipe into a guitar? Because it was here, perhaps? 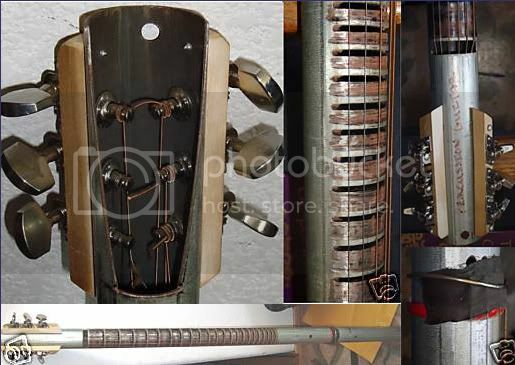 See how the frets have been formed by removing metal from the spaces inbetween them. What a strange approach. I'd hate to think how this tubular guitar plays. It's not exactly the most user-friendly design, is it? Friday Night Is Bond Night over at BBC Radio 2 on Friday 7 November. Recording on Monday 13 November, Ken Bruce hosts a concert of music from Bond films such as Licence To Kill, Goldfinger, Thunderball, For Your Eyes Only and Diamonds Are Forever. Leading the festivities is the 70-piece BBC Concert Orchestra, with performances from David McAlmont, Mica Paris, Tom Baxter and Jodie Prenger. You can apply for tickets for the Monday 13 November recording here. On a related note, the guitar pictured here is THE original James Bond guitar. The original theme was played on this very guitar - a Clifford Essex Paragon De Luxe - by the fantastically-named guitarist Vic Flick. The guitar currently resides in the Rock and Roll Hall of Fame + Museum in Cleveland, Ohio. 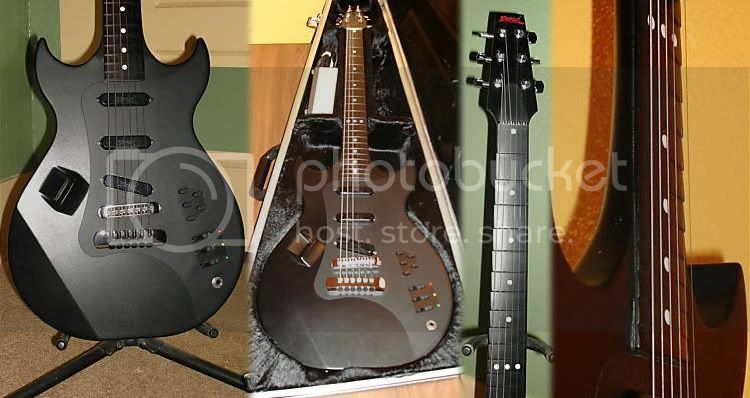 I remember when these carbon graphite Bond Electraglide guitars came out circa 1986. I thought the "fretless" stepped neck design was pure genius (in theory anyway) and always wanted to try one. However, it's quite a rare beast. When did you ever see one of these? The seller of this one claims that they were financed and endorsed by The Edge. I can't ever remember seeing him with one, but perhaps a dedicated U2 fan could point me in the right direction there. The only person I ever remember playing one of these was Mick Jones of Big Audio Dynamite (and formerly The Clash). I'm surprised that no-one else ever took up the stepped neck design. Perhaps it wasn't all it was cracked up to be. Has anyone out there ever played one of these? Let us know. Here's another Ampeg, this is one I consider to be quite tasty and desireable. It's an original Ampeg AEB-1 Bass and appears to be in all original condition, other than having been converted to fretless (which is no bad thing in my book). I love the through-body f-holes, the double-bass styled headstock, and also the fact that this bass comes with a spike that can be screwed into the bottom so that it can be played as an upright. You'll notice it doesn't has any obvious pickups. Some of the earlier Ampeg basses featured a rather unusual pickup that was supposedly a bit like a speaker in reverse mounted beneath the scratchplate. I'm not 100% on how exactly these functioned, so if anyone has any more info, please don't be shy in offering it up for us. Eastwood Guitars make some nice copies of these basses in both fretted and fretless versions but with the more usual magnetic pickups.